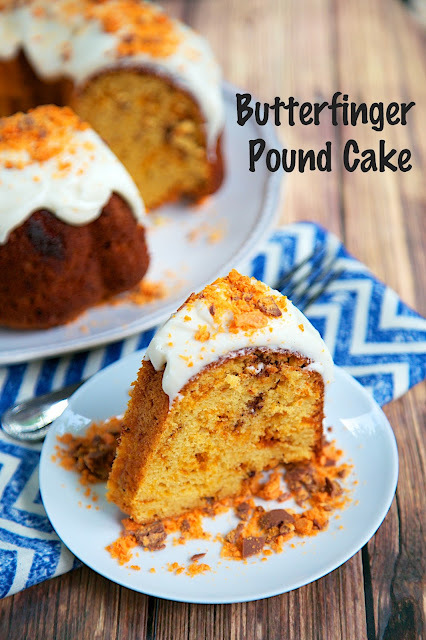 Butterfinger Pound Cake Recipe - yellow pound cake filled with tons of crushed Butterfingers, topped with homemade buttercream and more crushed Butterfingers. Simply amazing! Great for a crowd. This recipe was inspired on our trip to Chattanooga, TN earlier this year. We did a cooking demonstration at the home show and went out to dinner afterwards. There was a Butterfinger Pound Cake on the menu for dessert. I was SO excited. I absolutely love Butterfingers. We finished dinner and ordered the pound cake. It wasn't good. I was so disappointed. I was expecting something amazing, and it was mediocre at best. I knew I had to recreate the Butterfinger Pound Cake I was dreaming of at home. 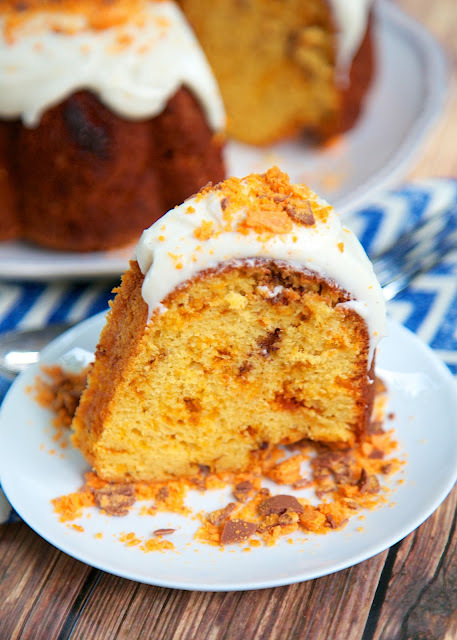 This recipe for Butterfinger Pound Cake was everything I was hoping for. Seriously delicious! The cake is full of crushed Butterfingers, and I even added a little bit more crushed Butterfingers on top of the homemade buttercream. I am of the opinion that you can never have too many Butterfingers! This cake was one of my all-time favorites. It was super delicious! It would be great for a potluck, if you can bring yourself to share! Combine cake mix, pudding mix, eggs, water, oil and vanilla in large bowl. Beat at medium speed with electric mixer for 2 minutes. Stir in crushed Butterfingers, reserving 1 or 2 Tbsp of Butterfingers for the top, if desired. Pour into prepared pan. Bake 50 to 60 minutes or until toothpick inserted in center comes out clean. Cool in pan 25 minutes. Invert onto serving plate and cool completely. In the bowl of an electric mixer fitted with the paddle attachment, cream butter until smooth and creamy, 2 to 3 minutes. With mixer on low speed, add 3 cups sugar, milk, and vanilla; mix until light and fluffy. If necessary, gradually add more powdered sugar to reach desired consistency. Spread frosting over top of cooled cake. Sprinkle with reserved crushed Butterfingers. This might be the best pound cake I've ever seen; I am a huge lover of Butterfingers! I'm a Butterfinger fanatic too! You'll love this! Oh my goodness, this looks AMAZING! And funnily enough, I was just talking about doing a weekend trip to Chattanooga within the next few weeks ourselves. =) Sounds like I'll skip the BPC cake there, and just make your version instead! I'm seriously a die hard Butterfinger Lover here! This looks amazing! I can't wait to try this! What a great way to have your cake and candy too!